Car seat guidelines have changed, and they'll keep your child safer, longer. 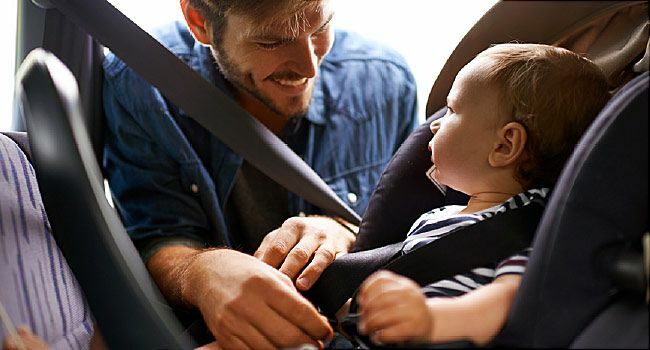 Ben Hoffman, MD, lead author of the new American Academy of Pediatrics (AAP) statement on car seat safety, explains what's changed and why. The AAP's 2011 policy on car seat safety mentions 2 years old as a minimum age for switching a child to a forward-facing seat. But Hoffman says naming a specific age overshadowed much of the rest of the statement, which was meant to be more broadly applied. "The key message was that parents should delay transitions for as long as they possibly can," says Hoffman, who’s chairman of the AAP’s Council on Injury, Violence, and Poison Prevention. The latest policy zeroes in on this largely missed point and leaves out age as a benchmark. The important takeaway: "Kids should stay rear-facing to the limit of the seat, which is defined by the manufacturer in terms of weight and length," he says. This goes for all car seats, not just rear-facing ones. As you move a child from rear-facing to forward-facing and then on to a booster, you lose some protection. So, keeping kids in the "youngest" seat they can safely ride in is best -- even if their second birthday has long since come and gone. "It runs counter to how most parents think, because we tend to look at reaching milestones as an exciting, positive thing," Hoffman says. "This is one of the few places where a milestone isn't necessarily something to reach for." There wasn't enough data to back up age 2 as a safety benchmark. In fact, the study on which the 2011 guidelines were based was eventually retracted because of inconsistencies in the ways they modeled statistics. "At that point, 2 was a fairly arbitrary point in time, but it was all we had," says Hoffman. Bottom line: Sitting in a rear-facing seat is the safest way for anyone to ride in a car, even adults. "In a crash, all the force is spread literally from head to toe, over half your body, which is the widest possible surface area you can get," says Hoffman. The cushion the seat provides protects the head, neck, and spinal cord, the most vulnerable parts of the body. Hoffman says the new policy helps change parent, family, and community behaviors, spurs innovation and development of products, and also paves the way for new laws: "We know that especially for injury prevention behaviors, having laws on the books is the single most effective tool for change." Anchor once. Install your seat with a seat belt or lower anchors, not both. They're equally good choices, so pick the one you understand better. Don't bundle under the buckle. Coats and car seat straps don't mix -- the added layer between the restraints and your child makes him less safe. Use a blanket over the straps instead. Benjamin Hoffman, MD, medical director, Doernbecher Tom Sargent Safety Center; director, Oregon Center for Children and Youth with Special Health Needs (OCCYSHN), Doernbecher Children's Hospital, Oregon Health and Science University. American Academy of Pediatrics: "Car Seats: Information for Families." National Highway Traffic Safety Administration: "Car Seats and Booster Seats."